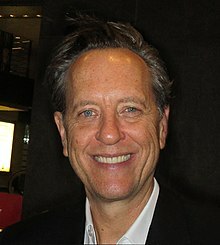 Richard E. Grant (born Richard Grant Esterhuysen; 5 May 1957) is a Swazi-English actor. He made his film debut as Withnail in the drama Withnail and I (1987). Other film roles include Jack Seward in Bram Stoker's Dracula (1992) and Zander Rice in Logan (2017). He won several critics' awards and was nominated for an Academy Award for his supporting performance as Jack Hock in Can You Ever Forgive Me? (2018). On television, Grant has played Bob Cratchit in TNT's A Christmas Carol (1999), Izembaro in the sixth season of the HBO series Game of Thrones, the Great Intelligence in the seventh series of Doctor Who and Simon Bricker in the critically acclaimed ITV/Masterpiece program Downton Abbey. He will appear in Star Wars: Episode IX (2019) in a currently undisclosed part. For the American paleontologist, see Richard E. Grant (paleontologist). Not to be confused with Richard Gant. 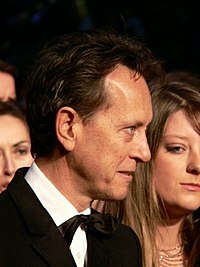 Richard E. Grant (born Richard Grant Esterhuysen; 5 May 1957) is a Swazi-English actor. He made his film debut as Withnail in the drama Withnail and I (1987). Other film roles include Jack Seward in Bram Stoker's Dracula (1992) and Zander Rice in Logan (2017). He won several critics' awards and was nominated for an Academy Award for his supporting performance as Jack Hock in Can You Ever Forgive Me? (2018). On television, Grant has played Bob Cratchit in TNT's A Christmas Carol (1999), Izembaro in the sixth season of the HBO series Game of Thrones, the Great Intelligence in the seventh series of Doctor Who and Simon Bricker in the critically acclaimed ITV/Masterpiece program Downton Abbey. He will appear in Star Wars: Episode IX (2019) in a currently undisclosed part. Grant was born Richard Grant Esterhuysen in Mbabane, Eswatini (formerly, Swaziland). He is the son of Leonne and Henrik Esterhuysen, who was head of education for the British government administration in the British Protectorate of Swaziland. He has English, Dutch/Afrikaner, and German ancestry. He has a younger brother, Stuart, from whom he is estranged. As a boy, Grant went to primary school at St Mark's, a local government school in Mbabane that had only recently become racially integrated. When Grant was 10, he witnessed his mother commit adultery in the back seat of a car with his father's best friend, which subsequently led to his parents' divorce. This event inspired Grant to keep a daily diary, which he has continued to do ever since. Grant wears a watch on each wrist, one given to him by his dying father, permanently set on Swaziland time. He is a dual citizen of the United Kingdom and Swaziland. Grant attended secondary school at Waterford Kamhlaba United World College of Southern Africa, an independent school just outside Mbabane, where he was a day scholar. Grant studied English and drama at the University of Cape Town. He adopted his stage name when he moved to Britain as an adult and registered with Equity. Grant was a member of the Space Theatre Company in Cape Town before moving to London in 1982. He later stated, "I grew up in Swaziland when it was mired in a 1960s sensibility. The kind of English spoken where I grew up was a period English sound and when I came to England people said, 'how strange'. Charles Sturridge, who directed Brideshead Revisited for TV, said, 'you speak English like someone from the 1950s'." Grant's first film role was the perpetually inebriated title character in Withnail and I (1987), which is considered a classic. Following this film, Grant started appearing in Hollywood films, quickly establishing himself as a powerful character actor in a wide array of films, from blockbuster studio movies to small independent projects. Over the past 20 years, Grant has had strong supporting roles in the films Henry & June, L.A. Story, The Player, The Age of Innocence, The Portrait of a Lady, Spice World, Gosford Park, Bright Young Things, and Penelope. While filming L.A. Story with Steve Martin, the pair communicated by fax in what became for both a hilarious dialogue: "I kept these faxes, which grew to a stack more than 2in thick, because they entertained me, and because I thought they were valuable aesthetic chunks from a screeching mind, a stream-of-consciousness faucet spewing sentences – sometimes a mile long – none of it rewritten, and bearing just the right amount of acid and alkaline." In 1995, Grant starred as the titular character in Peter Capaldi's short film Franz Kafka's It's a Wonderful Life. The film won the 1995 Academy Award for Best Live Action Short Film. In 1996, he portrayed a hilarious Sir Andrew Aguecheek in Trevor Nunn's film of Twelfth Night. He released a single and accompanying video "To Be Or Not To Be" with Orpheus in 1997. Grant has twice portrayed the Doctor from Doctor Who, both outside the main continuity. In the comedy sketch Doctor Who and the Curse of Fatal Death, he portrayed a version of the Tenth Doctor, referred to as the Quite Handsome Doctor. 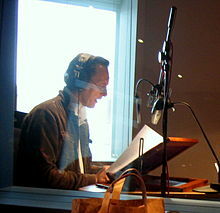 He also voiced a version of the Ninth Doctor for the BBC original animated webcast Scream of the Shalka. The latter had intended to be the official Ninth Doctor prior to the revival of the TV series. Grant made his first official Doctor Who appearance in the 2012 Christmas special, titled "The Snowmen", in which he plays the villain, Walter Simeon. During the episode Simeon is erased from his body and it is taken over by the Great Intelligence, voiced in that episode by Ian McKellen until the takeover. The Great Intelligence is one of the Second Doctor's most infamous villains and, was last seen in The Abominable Snowmen and The Web of Fear. Grant reprises the role in "The Bells of Saint John" and in the series 7 finale, "The Name of the Doctor". Grant as The Voice for 2+2+2 at Heavy Entertainment, London. Grant appeared as "The Voice" in 2+2+2 at American Nights at The King's Head Theatre, from 3 to 29 July 2007, and in 2008 co-starred in the London-based comedy Filth and Wisdom. On 22 November 2007, he gave a keynote speech at North London Collegiate School in north London as part of their Performing Arts Centre Opening Festival, and presented the 2008 Laurence Olivier Awards. In 2008, he made his musical theatre debut with Opera Australia, playing the role of Henry Higgins in My Fair Lady, at the Theatre Royal, Sydney, a role he reprised in 2017 at the Lyric Opera of Chicago. In 2009, he played Alain Reille in Yasmina Reza's one-act play God of Carnage at the Theatre Royal, Bath: and subsequently at Cheltenham, Canterbury, Richmond, Brighton and Milton Keynes. In 2010 he made an appearance in a music video, when short lived Bristol band The Chemists hired him to appear in their video for "This City"; the band split the same year. This appearance also followed up his previous involvement with the band the year before, in which he spoke the lyrics to "This City" to background music, as part of the intro and outro tracks on their only album Theories of Dr Lovelock. Grant was a mentor on the British Airways Great Britons Programme. In March 2013 Grant starred as intelligence analyst Brian Jones in David Morley's drama The Iraq Dossier, with Peter Firth, Anton Lesser, David Caves, and Lindsay Duncan. It recounted the story of how British Ministry of Defence Intelligence expert Jones had tried to warn that his government's September Dossier on Iraq's Weapons of Mass Destruction was inaccurate. In 2014, Grant was cast on the HBO series Girls because Lena Dunham saw him in Spice World. On 9 May 2015 Grant gave a reading at VE Day 70: A Party to Remember in Horse Guards Parade, London. In 2016 Grant joined the HBO series Game of Thrones in Season 6 as Izembaro. In 2017, he starred as Zander Rice, the main antagonist of Logan, opposite Hugh Jackman, in which he gained positive critical reception for his performance. In July 2018, Lucasfilm announced that Grant would appear in Star Wars: Episode IX. That same year, Grant's critically lauded performance as Jack Hock in Can You Ever Forgive Me? (2018), earned him Academy Award, BAFTA, Golden Globe and Screen Actors Guild Award nominations. The part also won Grant a New York Film Critics Circle Award and several other critics awards. Grant wrote and directed the 2005 film Wah-Wah, loosely based on his own childhood experiences. A screenwriter recommended he write a screenplay after reading Grant's memoirs of his Withnail and I experience. The film took him over seven years to complete, and starred Nicholas Hoult in the lead role, with Gabriel Byrne, Miranda Richardson, Julie Walters and Emily Watson. Grant kept a diary of the experience, later published as a book (The Wah-Wah Diaries). The book received positive reviews from critics, many of whom were impressed by the honesty of the tale, especially in regard to his difficult relationship with the "inexperienced" producer Marie-Castille Mention-Schaar. Grant stated in subsequent interviews that she was a "control freak out of control", and that he would "never see her again as long as [he] live[s]." In a BBC interview, he again mentioned his "disastrous" relationship with Mention-Schaar. He related that he had received only five emails from her in the last two months of pre-production, and that she rarely turned up on the set at all. She failed to obtain clearance firstly for song rights and secondly to film in Swaziland. For the last infraction, Grant was eventually forced to meet with the King of Swaziland to seek clemency. During an interview with an Australian chat show, he mentioned that Wah-Wah was not released in France, and as a result, his producer did not make money out of it. Grant married voice coach Joan Washington in 1986 and has one daughter with her, Olivia, and a stepson, Tom. Grant is a teetotaller. His body has an intolerance of alcohol, having no enzymes in the blood to metabolise it. If he does drink alcohol, he can keep it down for 10 minutes and is then violently sick for 24 hours afterward. After casting him as the alcoholic Withnail, director Bruce Robinson made Grant drink a bottle of champagne and half a bottle of vodka during the course of a night so that he had experience of the sensation. At age 12 he "developed a rhapsodic crush" on Barbra Streisand and remains a fan; he has done a tour of Streisand's New York, visiting her early home, her high school, and the Village Vanguard, among other places. In October 2008, he told The Times that he is an atheist. He is an avid supporter of Premier League football club West Ham United. In April 2014, Grant launched his new unisex perfume, JACK, exclusively at Liberty of Regent Street, London. Grant runs the perfume business in collaboration with his daughter. 1983 Sweet Sixteen Anton Episode: "Episode Six"
1993 Great Performances George Holly Episode: "Suddenly Last Summer"
1994 Absolutely Fabulous Justin Episode: "Hospital"
1999 Let Them Eat Cake Monsieur Vigée-Lebrun Episode: "The Portrait"
2004 Frasier Stephen Moon Episode: "Goodnight, Seattle"
2007 Agatha Christie's Marple Raymond West Episode: "Nemesis"
2008 Mumbai Calling Benedict T. Harlow Episode: "Good Sellers"
2011 Rab C. Nesbitt Chingford Steel Episode: "Broke"
2012 Playhouse Presents Stephen / Tony Episode: "The Other Woman"
↑ "Busy Making Other Plans: Richard E. Grant :: Stop Smiling Magazine". www.stopsmilingonline.com. ↑ "STAR PROFILE Richard E Grant". Evening Times. 5 June 2003. ↑ Busy Making Other Plans: Richard E. Grant, stopsmilingonline.com, 21 June 2006. ↑ "Richard E. Grant Biography (1957-)". www.filmreference.com. Retrieved 2018-01-08. ↑ "Richard E. Grant Biography – Yahoo! Movies". ↑ "Richard E Grant: At 11 I caught my mother cheating with dad's best". Evening Standard. 20 September 2007. ↑ Didcock, Barry (30 April 2006). "A life in pictures Richard E Grant not only made a film of his diaries, he kept a diary during filming". Sunday Herald. ↑ "Richard E Grant: Welcome to my family". The Independent. 2006-05-29. Retrieved 2019-02-13. 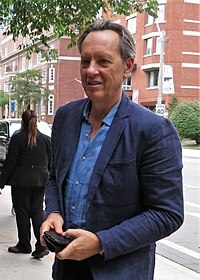 ↑ ""Richard E. Grant" (19 June 2006)". Enough Rope with Andrew Denton. Archived from the original on 5 August 2017. Retrieved 20 June 2006. ↑ "Richard E Grant: Welcome to my family". The Independent. London. 29 May 2006. ↑ "ENOUGH ROPE with Andrew Denton – episode 108: Richard E. Grant (19/06/2006)". Archived from the original on 5 August 2017. Retrieved 20 June 2006. ↑ Interactive, FreshForm. "Busy Making Other Plans: Richard E. Grant :: Stop Smiling Magazine". www.stopsmilingonline.com. Retrieved 2018-01-08. ↑ Interview with Valerie Lawson of the Sydney Morning Herald on 04/06/08. ↑ Martin, Steve (2015-09-26). "'A slag-fest collusion': Steve Martin on his friend Richard E Grant". The Guardian. ISSN 0261-3077. Retrieved 2018-01-08. ↑ Swazi 'Aids cure' scam uncovered, BBC Newsnight. ↑ "Richard E Grant investigates the AIDS scam", Newsnight, 1 December 2006. ↑ "Richard Chats About God of Carnage". ↑ Airways, British. "British Airways Media Centre". www.britishairways.com. Retrieved 2018-01-08. ↑ Reynolds, Gillian (6 March 2013). "Drones Dossiers And How Iraq Changed The World". The Daily Telegraph. ↑ Blistein, Jon; Blistein, Jon (2018-11-15). "Richard E. Grant Talks Gifts 'Spice World' Role Keeps Giving on 'Corden'". Rolling Stone (in Kinyarwanda). Retrieved 2019-01-23. 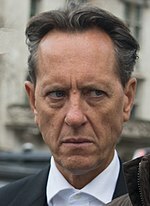 ↑ "Richard E. Grant joining the cast of Game of Thrones!". Watchers On The Wall. 7 September 2015. ↑ "Star Wars: Episode IX Cast Announced". StarWars.com. ↑ "Winners & Nominees 2019". GoldenGlobes.com. Hollywood Foreign Press Association. Retrieved 9 December 2018. ↑ "2018 Awards". NYFCC.com. New York Film Critics Circle. Retrieved 9 December 2018. ↑ "Nominations Announced for the 25th Annual Screen Actors Guild Awards®". SAGAwards.org. Screen Actors Guild. Retrieved 15 December 2018. ↑ "Wah-Wah Interview – "I've had seven birthdays..."". Archived from the original on 30 June 2009. Retrieved 21 August 2008. ↑ Grant, Richard E. (2006-04-21). The Wah-Wah Diaries: The Making of a Film. Place of publication not identified: Picador. ISBN 9780330441964. ↑ Ecott, Tim (2006-05-05). "Review: The Wah-Wah Diaries by Richard E Grant". The Guardian. ISSN 0261-3077. Retrieved 2018-01-08. ↑ "US". The Independent. Retrieved 2018-01-08. ↑ "Richard E Grant – Wah-Wah interview". Archived from the original on 30 June 2009. Retrieved 21 August 2008. ↑ "The Sun Herald Interview – Wah-Wah". Archived from the original on 21 November 2008. Retrieved 21 August 2008. ↑ Gross, Terry; Grant, Richard E. (13 December 2018). "Richard E. Grant Barely Survived Childhood. Now He's Thriving As An Actor". National Public Radio. United States. Retrieved 31 January 2019. ↑ "Five Minutes With: Richard E Grant". BBC News. 11 December 2010. ↑ Syme, Rachel (2019-02-11). "Richard E. Grant Hearts Barbra Streisand". ISSN 0028-792X. Retrieved 2019-02-19. ↑ "Page not found". www.secularism.org.uk. ↑ "Jack by Richard E Grant « big fish® – branding, design + marketing consultants". www.bigfish.co.uk. Retrieved 2018-01-08. ↑ Stadlen, Matthew (17 December 2015). "Richard E. Grant: Why my father's alcoholism has made me love Christmas". The Daily Telegraph. Retrieved 31 January 2019. ↑ "Richard E Grant's Hotel Secrets". Official website. British Sky Broadcasting. Retrieved 3 January 2012.